So we all grew up watching Roadrunner cartoons, right? And that silly little bird, while definitely having a sadistic streak, doesn’t seem all bad. In fact, he’s kind of cute, which makes rooting against the coyote, who is admittedly trying to make a meal out of him, seem like the right thing to do. Lies. It was all lies. Little did I know how bloodthirsty these angry birds were until I watched one kill a tarantula in front of my motel room door in Big Bend, TX. You read that right…a tarantula. And perhaps you also noticed how I said RIGHT IN FRONT OF MY ROOM, where one would hardly expect to see a cage match of such colossal proportions. Don’t let the cartoons fool you, this bird is evil! 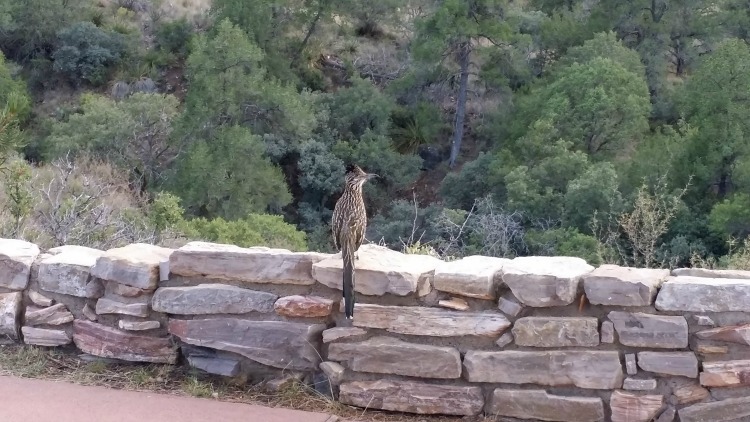 Now I’m all about wildlife, but staying at the Chisos Mountains Lodge, the only accommodations located within 900,000-acre Big Bend National Park, takes animal viewing to a whole new level. Not only did I get to watch a life-and-death struggle within inches of where I was sleeping (though obviously not through the night once I knew that there were tarantulas out there), but I also got blocked from returning to the hotel by a pair of mule deer that were locking horns alongside the hiking trail, reminding me that while I might think I’m at the top of the food chain, my chewed-up fingernails are no match for a set of hooves or horns. So I run to tell Terri all about my morning. Me: You won’t believe what I just saw. 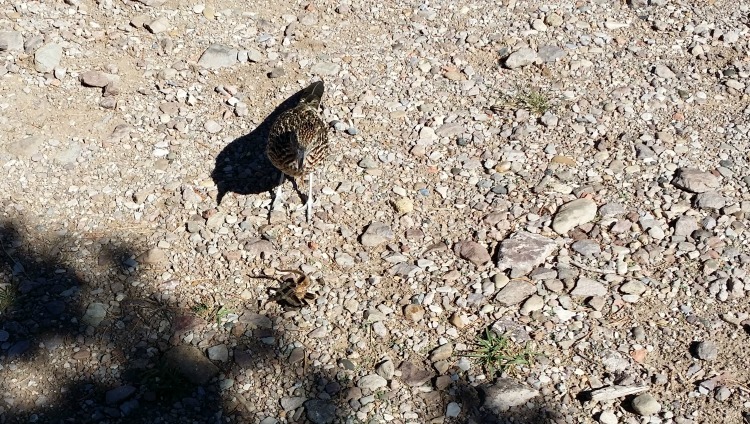 A roadrunner and a tarantula were fighting outside my door. Terri, totally skeptical: Right. And then the coyote showed up with a delivery from ACME. Me: Seriously. It was horrible! I wanted to save the spider, but I couldn’t figure out how to grab it. Cause it was big. And hairy. And the bird was really mean! Terri: You were trying to grab a tarantula? Aren’t they poisonous? Me: So maybe it wasn’t my smartest move. Terri: You’ve done stupider things. Note that at this point I didn’t bring up the fact that Terri tries to pet every young furry creature we come across, without ever considering that their large and angry mommas might not appreciate her fondling their offspring. I was still too excited about the deer. Me: And then I was walking up the trail and found myself surrounded by a herd of deer! And two of them started head-butting! I had to wait until they stopped fighting to get around them. Terri: You have literally been gone like 15 minutes. You’ve tried to pick up a tarantula and been accosted by angry deer. Do you have some kind of death wish? Me: No, but I do have video! Of course, all was forgiven. At this point, our guide, Mike Davidson, shared a wealth of knowledge about the wildlife around Big Bend, which is home to 3,600 species of insects and animals, and 450 species of birds. He shared the fact that tarantulas, while poisonous, aren’t really going to kill you, and that roadrunners, despite their good Warner Brothers’ PR, are actually really vicious birds that will fight just about anything, including lizards and small rattlesnakes, which they kill by bashing them with their beaks. Starting to make you feel kind of bad for the coyote, isn’t it? I have all this in mind the next day when Mike says that we’re going to take a hike up the Lost Mine Trail. But I didn’t need to worry about the creepy things and killer birds, because there are bigger things to be concerned about. Terri: There sure are a lot of mountain lion warning signs around here. That’s kind of scary. What do we do if we see one? Me: We run. And I hope I run faster than you. Turns out that we needn’t have worried about the mountain lions either, because the people coming down from the mountain stopped to tell us about the black bear they saw…about 20 feet ahead. Terri: Dear God. Is there anything in this country that won’t kill us? Me: Well, I’ve heard the tarantulas are pretty harmless. 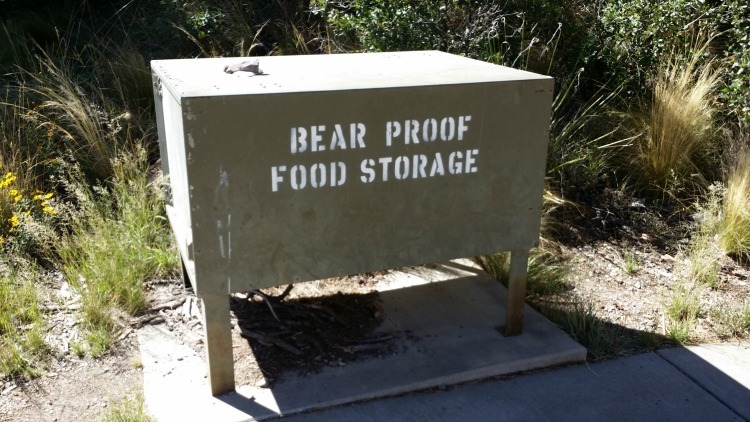 Oh look, a place to hide from the bears! We make it to the top of the 6,850-foot peak with about 100 stops on the way to take photos of the stupendous landscapes, and to double-check that no large carnivores are waiting to take us down as we are obviously far easier prey than any creature that lives in such a contentious environment. Vanessa: So Mike, are there any other animals that we need to know about—any other creatures unique to Big Bend? Mike: Well, there is a goat. But he’s harmless. 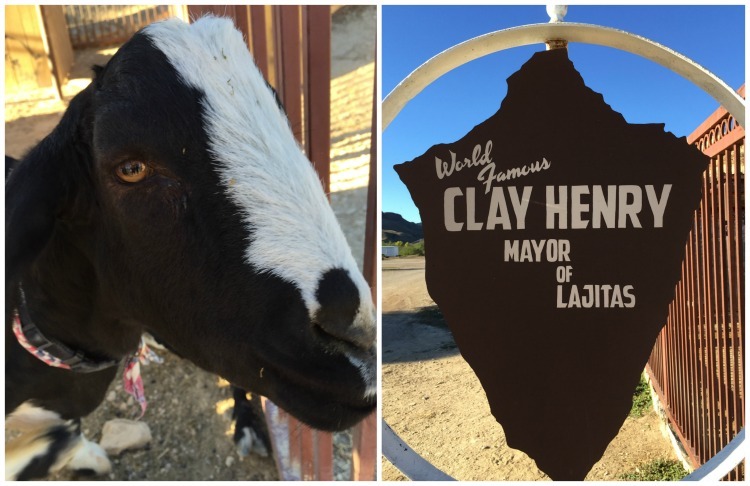 He’s the mayor of Lajitas. 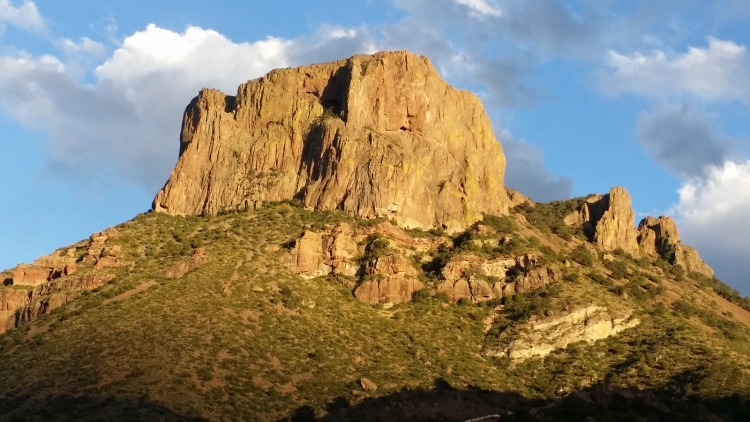 There are numerous places to stay around Big Bend, TX, but for a truly authentic experience, make reservations (well before you want to visit because it books up fast) at the Chisos Mountains Lodge located within the park. In addition to wildlife viewing, there are also 200 miles of trails within the park for every level of ability, so you can get your exercise (especially if you end up running from a bear or mountain lion, or even a raging roadrunner). Chisos Mountains Lodge: To learn more about accommodations within the park, check out www.chisosmountainslodge.com. Reservations for 2019 (that is not a typo) are now open. While not fancy, the rooms (which run about $148 a night) put you right in the center of a whole lot of animal action. For more information, www.visitbigbend.com, or call the Brewster County Tourism Council at 432-386-5635.